White Gold, recently introduced from Cornell, is a self-fertile variety that needs no pollinator. New high quality cherry varieties, particularly the self-fruitful introductions, combined with the availability of dwarfing rootstocks such as Gisela 5, and innovations in training systems, have led to great advances in cherry culture for both home growers and orchardists in recent years. Certain varieties have less genetic tendency to crack – usually those with somewhat softer flesh. Smaller trees can be netted for bird protection and are more easily accessible for pest management. New training systems combined with high tunnel technology are being developed to extend growing seasons and provide rain protection. Later ripening varieties (late July to August) may take advantage of the better weather and late market opportunities for on-farm sales. 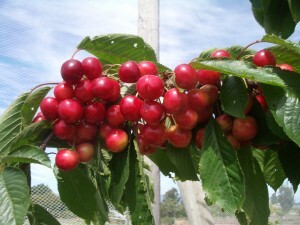 The main problems with growing cherries in western Washington are fruit cracking, bacterial canker, and damage to the crop by birds. Cherry bark tortrix, an insect that bores holes in tree trunks, can damage sweet, tart, and ornamental cherry trees. Now the arrival of a new insect pest, Spotted Wing Drosophila (D. suzukii) has added another threat; it attacks and damages the cherry fruit before and during ripening. Bacterial canker often attacks sweet cherry trees in western Washington, and over time it is probably the most serious threat to tree health. Tart (pie) cherries such as Montmorency are usually much less susceptible to canker, show little damage from rain, and because they are often later blooming, the weather conditions at bloom time make good pollination more likely. 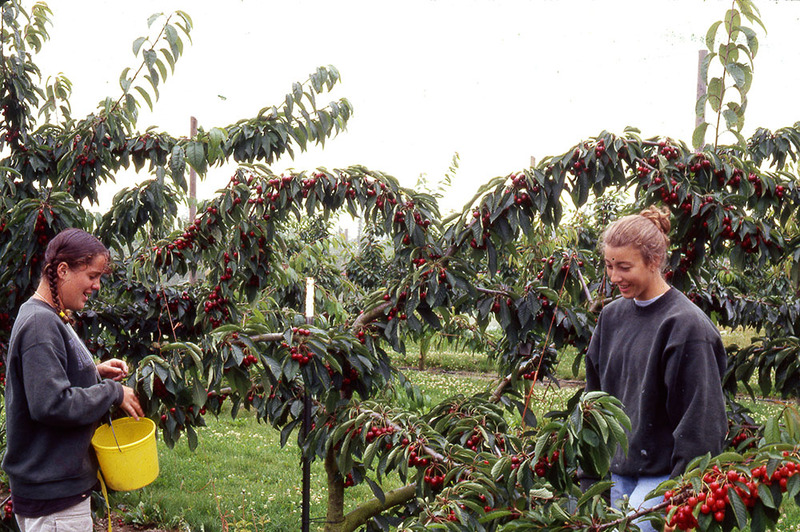 Harvesting Lapins cherries from trees grafted to dwarfing Gisela 5 rootstock. In 2012 the cherry orchard block at WSU Mount Vernon NWREC was used as the site for the annual cherry field day co-sponsored by the Western Washington Fruit Research Foundation and WSU. See “Resources” below for presentations at the workshop. Future plantings are targeted to new cherry introductions and advanced selections from breeding programs at WSU, Cornell (Geneva, NY), BC Summerland, and the University of Michigan.